Last week at the McSpedden Library our Kindergarten and 1st Grade students reviewed the difference between Fiction and Nonfiction books. For our Kindergarten students, after the lesson, they were able to start choosing books from the nonfiction shelves as well as the fiction shelves. In the Kindergarten lesson, I read Curious George Goes to the Library, a fiction book, and then I read Let’s Go to the Library, a nonfiction book. After I read both books and we examined the text features of both, our Kidergarten students and I looked at several books and marked them as either F for fiction or NF for Nonfiction on this Fiction or Nonfiction Activity Page. 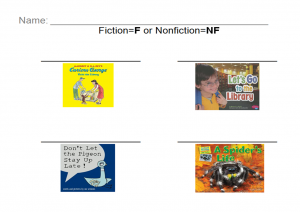 In the 1st Grade lesson, We examined the text features of both fiction and nonfiction books (the same ones I used with kindergarten), our 1st graders also marked them as either F for fiction or NF for Nonfiction on this Fiction or Nonfiction Activity Page. However, after we looked at several books and identified the text features of the books, then we filled out this Fiction and Nonfiction T-Chart. Both the Kindergarten and 1st Grade students had already been learning about Fiction and Nonfiction text features in their class, so it was fun to carry that learning into the library and have our Kindergarten students start checking out Nonfiction if they wanted to! 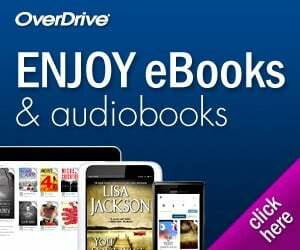 I appreciate you posting your lessons and sharing them! Thank you so much, they have been a huge help to me this year.